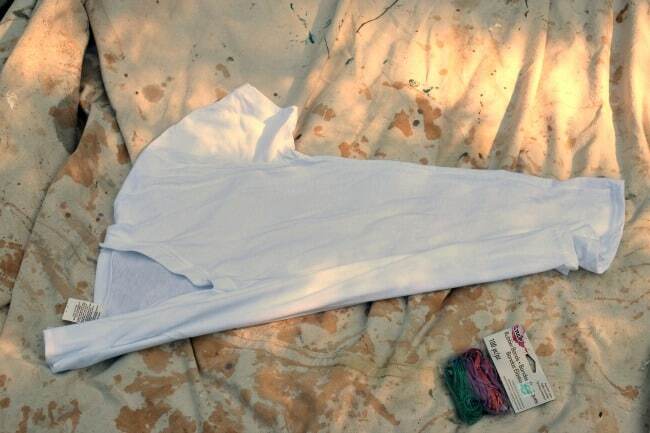 If you have been wondering how exactly to make tie dye shirts, then you are my friend in the right spot. If I can do this, and have it turn out looking pretty good, so can you. Plus you really can’t go wrong. The whole fun is in mixing the colors and creating fun patterns. 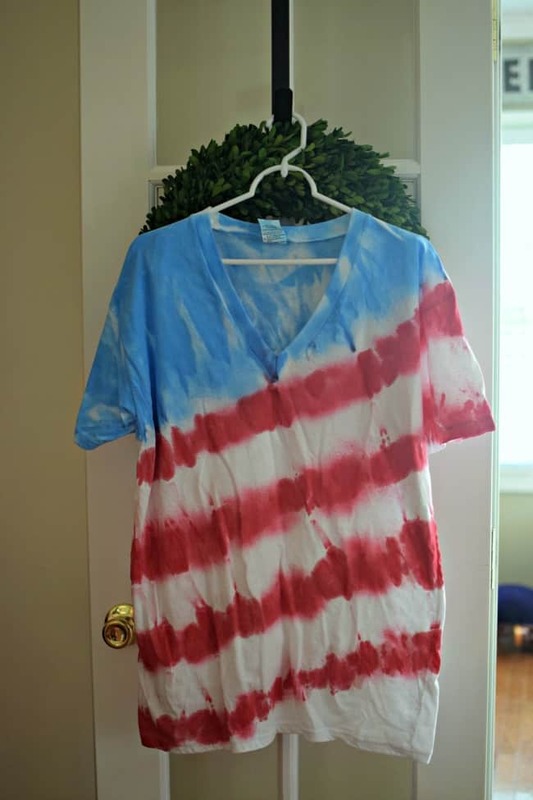 Today’s tie dye shirt though is perfect for the upcoming 4th of July holiday, an American flag pattern. First off we should definitely start off with what you will need to make your shirt. 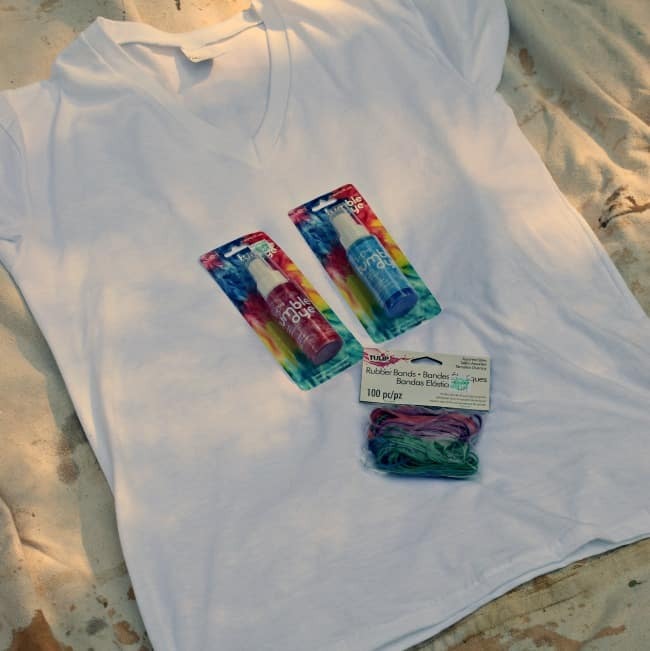 You will want a white cotton t-shirt (hmmm… shocker… lol), rubber bands, dye (red and blue for this pattern), bottles (if you don’t buy a kit or dye already set up for tie-dying). rubber gloves and a drop cloth (both optional but highly recommended). As you can see in the photos we use the drop cloth a LOT. 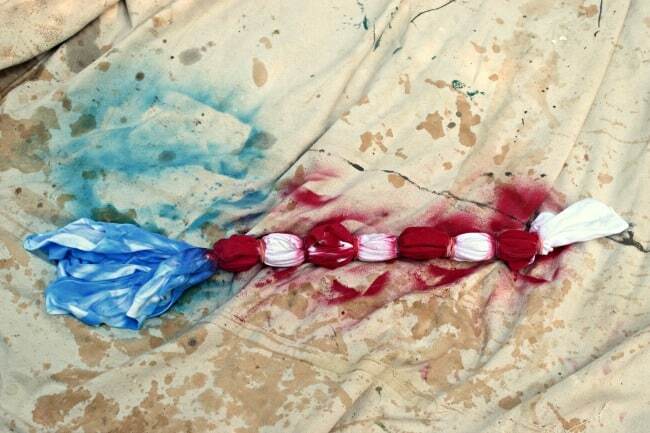 The first step in tie-dying is figuring out what pattern you want to create. Here is a great site on all the different patterns you can do. 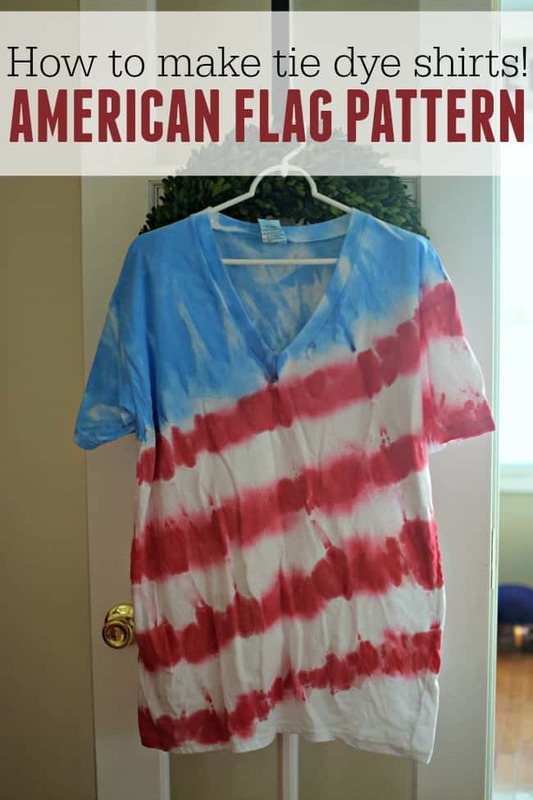 For this American flag pattern, I folded the shirt in a diagonal. Once folded you can rubber band the shirt so that the dye won’t bleed. The first part will be wider to create the blue portion of the flag and then the others will be spread apart evenly. 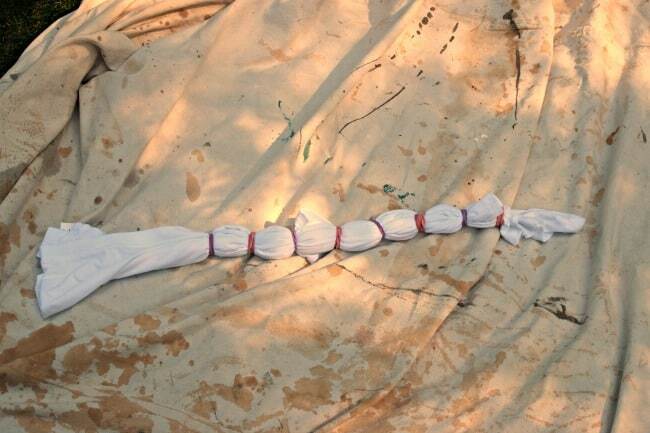 Once you have your shirt rubber banded you are ready to start the process of tie-dying. I actually used a spray bottle style so it wasn’t as messy for me. If you are using a bottle of dye I would suggest putting your shirt on a rack so the dye won’t puddle and bleed through to the other parts of the shirt. Allow your shirt to dry fully. Most likely overnight would be best. Then you can cut off the rubber bands and heat set in the dryer for 20 minutes. Once heat set you can wash as normal. Note: I would wash it by itself for the first couple of times just to be on the safe side. Don’t forget in this whole process of learning how to make tie dye shirts that you aren’t just limited to t-shirts. You can tie-dye all sorts of things from shorts to shoes and pretty much everything in between. Plus it’s a pretty fun way to get outside and enjoy the summer while creating something pretty to wear as well.